Teased two weeks ago, the 2018 Mazda 6 has made its debut at the 2017 Los Angeles Auto Show. This second facelift for the D-segment sedan boasts “unparalleled craftsmanship, design and technologies” that elevate it from its traditional competitive set into a higher class, says Mazda, which also claims that the new sedan offers a “refined experience befitting of a far more expensive car.” Not a company that’s shy with words, that’s for sure. Mazda is proud of the fact that in the US, around 55% of all Mazda CX-9 SUVs sold have been either high-level Grand Touring models or top-trim Signature models, with the latter selling more than twice as well as expected. This has led the Hiroshima-based carmaker to follow the same path for its flagship sedan. Up front sits a revised fascia seemingly inspired by the new CX-5, with a new grille surround that flows under – rather than above – the headlights. Speaking of which, the light graphics have also been redesigned with new LED daytime running lights, while the bumper incorporates the slim “whiskers” from the CX-5. On top of that are a new 19-inch wheel design and the new Soul Red Crystal paint. 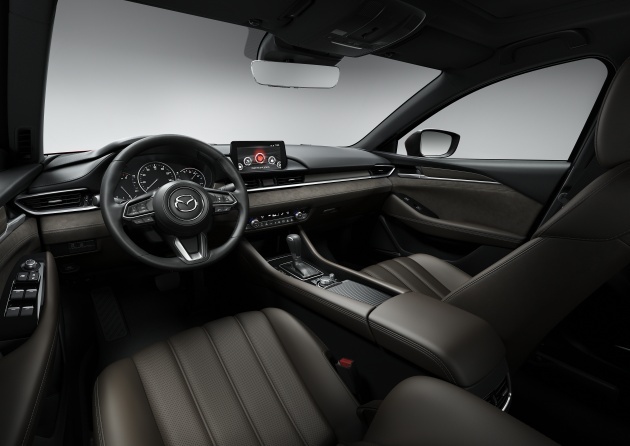 Inside, the big Mazda gains a comprehensive interior update, including an all-new horizontally stretched dashboard – the second it has received since 2012. Only the steering wheel and small trim pieces have been carried over from its predecessor. The minimalist cabin features new climate controls and Japanese Sen wood trim that sits on the same line as the slimmer air vents. The cabin also features brown Nappa leather (colour inspired by aged wood in ancient Japanese temples) and UltraSuede NU adorned with a subtle gold tint. The latter uses a similar technique to that which is used to make ornate kimonos, Mazda claims. The 6’s front seats have been redesigned. They are now wider, with high-density, vibration-absorbing urethane foam that creates a firm, supportive seating surface. The chairs are designed to help keep front passengers’ spines in the natural S-shape humans use when standing, Mazda says. Available ventilated seats are a first for the brand. New tech include a 360-degree view monitor, a reconfigurable seven-inch TFT gauge display in higher-trim models, a new eight-inch infotainment display with sharper contrast, available full-speed Mazda Radar Cruise Control with Stop & Go, windshield wiper de-icer and a windshield-projected Active Driving Display head-up display. New for model year 2018 is a chassis that has been thoroughly revised to provide a more supple ride, greater agility and dramatically improved NVH, Mazda claims. Under the hood is the 2.5 litre naturally-aspirated SkyActiv-G engine, now with cylinder deactivation. The outside two cylinders can shut down when the vehicle is operated at steady speeds between 40 and 80 km/h, but all four cylinders work together when full power is needed. A centrifugal pendulum has been adopted in the torque converter of the six-speed automatic to counterbalance any vibration that might otherwise be felt when running on two cylinders. Those who want more can go opt for the SkyActiv-G 2.5T turbo unit from the CX-9, making 250 hp and 420 Nm from 2,000 rpm here. That’s torque on par with a 4.0 liter V8, says its maker. “As a champion of the manual transmission,” Mazda will continue to offer the six-speed manual gearbox, but only with the NA engine – sorry, there’s no MT turbo. All the above enhancements combine for a “Mazda Premium” experience that the brand hopes can push it beyond mainstream vehicles, which we take to mean the Honda Accord and Toyota Camry, both recently refreshed in the US market by the way. 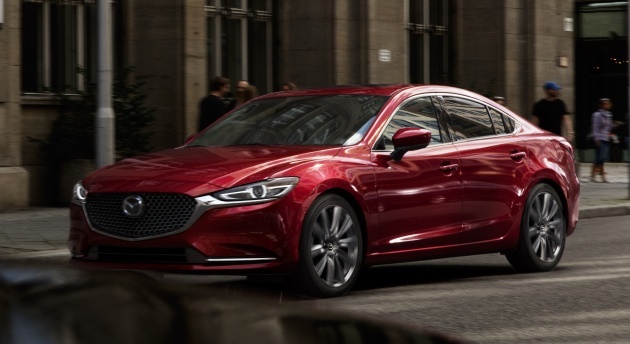 The 2018 Mazda 6 will go on sale next spring. 250 hp from a 2.5 turbo is ridiculously low. It should develop at least 320 hp. Look, even a civic turbo with 1.5 engine going through ecu remap can put out 225 hp. CVT gearbox also no problem and can take the load because the gearbox is ultra durable. Obviously there are plenty of room for more power if remap is done on this 2-5 engine. Is not all about big numbers it’s the overall balance of drivability, fuel consumption and smooth power delivery. It already has an impressive torque of 420Nm, which will translate into better acceleration in low and medium speed range. Higher hp only gives you advantage in top speed. How many times on the road do you think you can really fully utilize a car’s hp? Its not tuned for high hp. 420Nm of torque from a 2.5L engine is great enough. U like volvo s90 or Mazda 6? Agree with U. This Mazda6 beats the BMW 3 series in terms of Power, Space & Specs without compromising its looks. Which one? If u mean 2.0T F30 328i then the performance should be not far behind the turbo mazda 6. IS it me or do you guys feel the same that almost every Mazda model have the same front look almost everytime even after face lifting it ? That’s the trend now. The “face” of the car represents its brand. It’s been like that for most continental cars (VW, Porsche, Audi? OK Porsche looks the same for decades lol). Only recently Honda adopted the same strategy. Honda City FL’s front design is adopted from the Civic. Family face. Hate it or love it. For mazda, it looks nice. This is a great driver’s car but I doubt the 2.5 Turbo will ever make it here. Furthermore with Bermaz’s pricing, the Mazda brand will never become a mainstream brand unlike Honda, Toyota and Nissan. Why is it called facelift? When it is totally all new inside out? Btw nice design. And hopefully mazda Malaysia will bring in the petrol 2.5T as well as the 2.5T diesel. It depends. It does seat on a current platform, hence the facelift term. Similarly, Gen2 CPS was called a facelift even thou its all new inside out and new engine too. First copy 3 series, now copy Jaguar. When will Jepunis be original like P1? It will be priced exorbitantly high, beyond the reach of even the rich in Bolehland! For many Malaysians (myself included) who cant afford a CKD basic E-class W213 or the ultimate E63 AMG S model, this is an excellent choice for a mid size sedan with sporty looks and great engine. Very well maintained 2011 C250 CGI. Wilayah Persekutuan double digit registeration. I thought the current 6 is very nice but this is even nicer! I am amaze that Mazda is able to continuously keep the 6 looking fresh since 2012. A small change in front facial can make such a big difference. When will Bermaz start selling here.